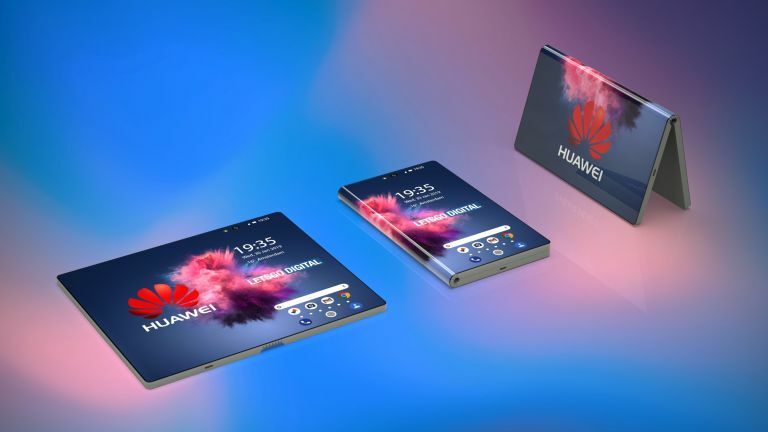 In October 2018, Huawei confirmed that it was developing a a 5G foldable phone to take on Samsung's folding Galaxy X. Now we have a tantalising glimpse of what that folding phone might look like. The 3D images have been created by Dutch site LetsGoDigital, which has based the renders on leaks and rumours surrounding the new handset. Unlike the Samsung Galaxy X, which has the folding screen on the inside of the screen, the Huawei folding phone is shown featuring the folding screen on the outside. That's the same approach that Motorola is rumoured to be taking with its new folding phone. LetsGoDigital points out that this approach is technically easier to implement, as well as cheaper as a second screen – as the folding Galaxy X has – is not needed. In terms of a name, LetsGoDigital notes that Huawei submitted a series of trademark applications for the model names Mate Flex, Mate Flexi, Mate Fold and Mate F at the end of last year, so it could well end up taking one of those monikers. When will we see this new folding phone? As with so many of the handsets destined to be released over the coming months, it looks as though it might break cover during MWC 2019, which runs in Barcelona from Monday 25 February to Thursday 28 February. Indeed, LetsGoDigital notes that Huawei has sent out invites to a press conference which takes place on Sunday 24 February at 2pm CET (1pm GMT), so we could see it announced alongside the Huawei P30 and P30 Pro. Take a look at that invite and see just how clearly it teases the folding phone and its 5G connectivity.